An anti-violence comic by a Christian police group has been banned by the Metropolitan Police after being accused of ignoring other faiths. The comic book, Cops and Robbers, has first-hand stories from criminals who have embraced Christianity. But Scotland Yard said it will not distribute the comic without wider consultation with faith groups. A member of the Christian Police Association (CPA) says the group aims to reverse the Met's decision. "It is essential that we respond effectively to the needs of all faith groups and that the potential impact of any initiative is carefully considered," a Metropolitan Police statement said. Des Brown, a convicted killer who now works in a Christian youth group, says he wants criminals to become Christians. "The purpose of this comic is to put forward a story that people's lives can be changed by the power of Jesus Christ. That's the point of the comic." Pc David Turtle, deputy chairman of the CPA, said: "We would express our disappointment to the commissioner and the Metropolitan Police Authority. We would be seeking ways in which this can be reversed." The CPA is believed to have around 1,000 members within London's police force. 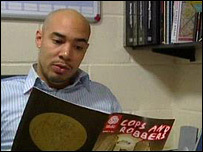 The comic was designed to be given out to youths being held in custody cells. Commander Alf Hitchcock, of the Metropolitan Police, said: "I welcome the involvement of the Christian Police Association - the Cops and Robbers publication is an innovative and positive concept. "However, it is important that effective consultation takes place, in relation to the material, and that the needs of other faith groups are also considered as part of the ongoing work being undertaken by the Custody Directorate."